Exclaimer’s email signature solutions allow you to centrally create and manage email signatures for your whole organization. Whether you’re using Office 365 or Exchange, you can create high quality, professional email signatures and deploy them to individual users, groups or departments in minutes. Different signatures for reply and internal emails. Preview the signature while editing. Signatures on Macs and mobiles. Control from a central location. 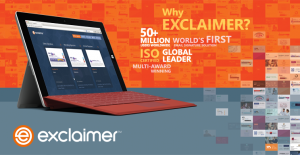 Check out www.exclaimer.co.uk for more information.